SWAZI-The worlds most durable clothing. Swazi Bush shirt. ......well, I just wear it alot!. for sheer miles on the clock, this is it!. Its just seems to fit any situation. I have cut wood in it, hunted in it, camped and slept in it, sat on it, wiped my gun with it, even lead a horse with it (not recommended) and it still looks like new. This Bushshirt is extremely durable and easy to look after. It drys quickly, is strong ,warm and wears like iron.Over the years it has become a firm favourite. 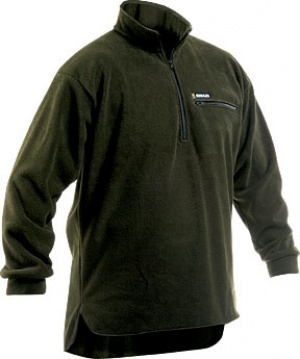 It has that most simple useful design, a low cutback, high collar, 1/4 zip and snug cuffs- it works. Oh, and its SWAZI. " Purchase through PayPal by using the "Add To Cart" button above or use the form below to order the Swazi Bush Shirt . Feel free to contact us if you have any questions about the Swazi Bush Shirt .